252 p., 15,5 x 21,0 cm. With contributions by Johann Joachim Müller and Johann Philipp Palthen. The Latin book entitled ›Über die drei Betrüger‹ (On the Three Impostors) (Moses, Jesus and Mohammed) is the classic document of religious criticism in underground literature and at the same time one of its most puzzling texts. Up to now, there has been no clarification as to whom it should be ascribed or when it was written. Current suggestions range from the 15th up to the late 17th century. Previously unknown evidence now attributes this work with certainty to the Hamburg jurist Johann Joachim Müller, already suspected of writing this, who according to several independent witnesses wrote it in 1688 or shortly beforehand. For the first time, the text, which in previous editions was always published on the basis of the severely flawed editions of the 18th century, is being presented in a critical edition. The Latin treatise is accompanied by a translation entitled ›Von den Betrügereyen der Religionen‹ (On the Deceptions of Religions)(1761) which can be attributed to its era. The previously unknown transcription, in a handwritten version, was done by Johann Christian Edelmann, who provided the text with a comprehensive in-depth commentary. 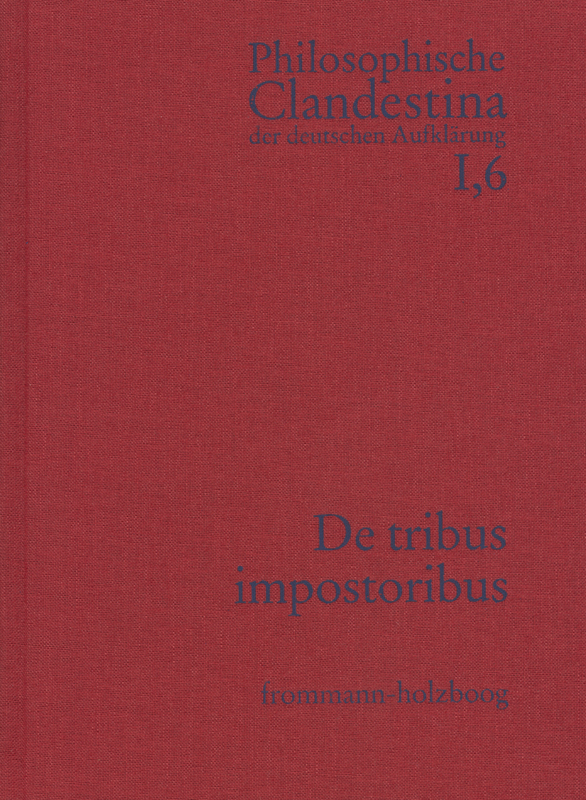 Anonymus Johann Joachim Müller (1661–1733)]: De imposturis religionum (De tribus impostoribus). Von den Betrügereyen der Religionen. Müllers [...] Schrift [gebührt] Interesse, weil sie zu den frühesten Äusserungen eines philosophisch begründeten Atheismus im deutschen Sprachraum zählt. Ein umfassendes Literaturverzeichnis und ein Personenregister runden die Ausgabe der Disputationsthesen Müllers und ihrer auszugsweisen und kommentierten Übersetzung durch Edelmann ab.